Find out how these changes affect the viewer experience and what you can do to take control over your content. Last September, YouTube made some changes to the way embedded YouTube players behave. 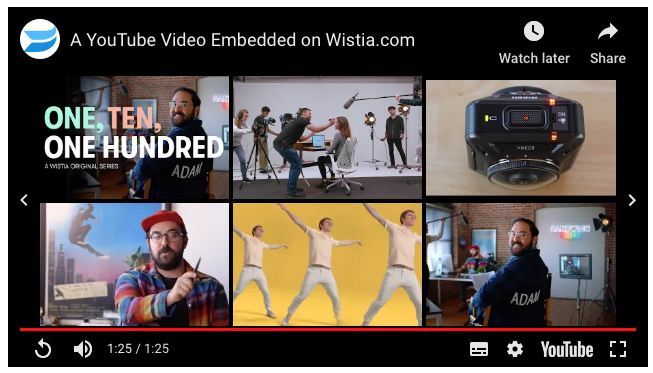 Now, related videos will always show at the end of any embedded video, offering users a grid of suggested options for what to see next, based primarily on the user’s own YouTube viewing history. You can read the full release notes for more details, but in the meantime, we’re happy to answer some of the questions we bet are brewing in you brain right now. So, here’s what you need to know about the changes to YouTube videos embeds and what it means for your business. You can, however, change the “rel" parameter within your embed code to “0” to ensure only videos from your channel appear after the end of the video, like this. However, you can’t control which of your videos come up at the end, so watching a product video may lead viewers to support videos for products they haven’t yet purchased. And, what’s more, when you click to play those videos, they don’t play within the player on your website, but instead send users off to YouTube.com in a new tab. What’s wrong with sending my users to YouTube? Well, to put it bluntly, chances are they won’t come back. The prospect of watching naughty dogs steal food is likely more compelling than anything your business has to offer (we’re just stating the facts here). Don’t believe me? 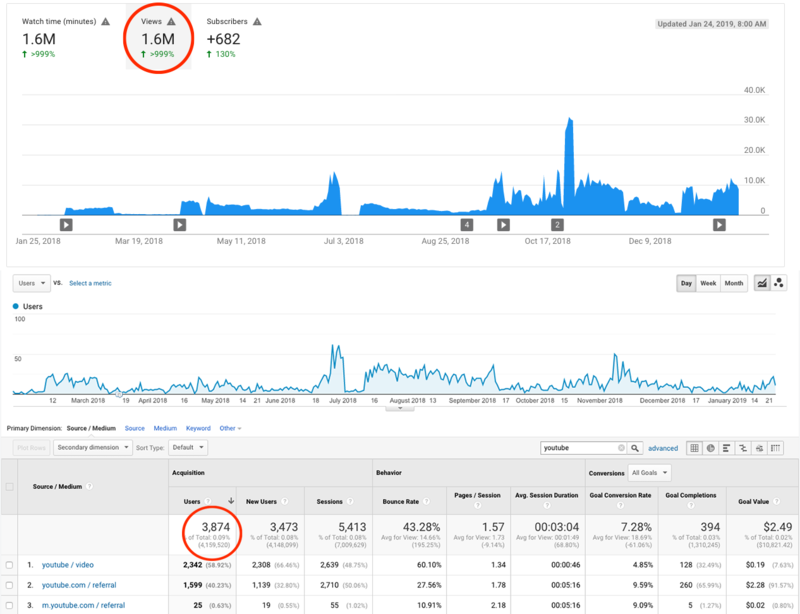 Go into your Google Analytics and see how much traffic comes to your site from YouTube.com, then compare that with the video views you’ve accrued over that period. Here’s a look at some Wistia data over the past year that compares the two. For context, this actually happened to be a period of time where we’d gained some traction with our YouTube marketing efforts. According to the data above, of our 1.6 Million views over the year, only 3,874 turned into a visit to wistia.com. This means that 0.2% of people who watched a video clicked through to our website (we put links in the video descriptions and ad overlay end-cards). Why did YouTube make this change? In reality, the motivation behind this change is almost certainly to drive more traffic to YouTube itself. Because YouTube makes money primarily through advertising, its incentives are aligned with getting users to as many videos as possible on their platform, and serve them as many videos as possible, so they can then serve more ads. YouTube is a remarkable platform, no doubt about it. It provides free hosting and reliable video delivery to everyone, combining it with the best search infrastructure available. But, it’s also a platform serving many masters — and, unfortunately, your website isn’t one of them. While YouTube will let any business use their platform for free and serve videos with embedded players as much as they like, there is a price to be extracted, and that price is traffic. But isn’t YouTube great for SEO? In a sense, yes. Embedding YouTube videos is great for increasing the visibility of YouTube videos on YouTube and in Google search, but users will always be sent to YouTube.com, rather than your website. And if you’re a business for whom website traffic is a secondary concern to social media traffic (e.g. some fast moving consumer goods brands), then it can make sense to try and drive your audience to YouTube rather than your site. But, the often repeated narrative, “Google owns YouTube, so YouTube must be good for SEO,” is therefore a strange miscalculation for many people. Typically the goal of search engine optimization is to drive traffic back to one’s own website, not to just rack up as many video views as possible. You don’t need to have videos on YouTube to get them ranking in Google search for relevant queries. 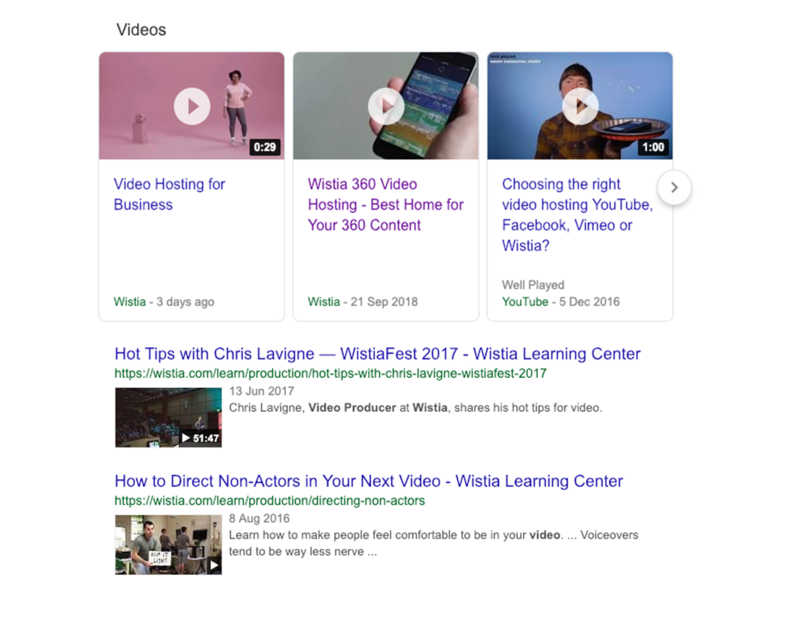 In fact, any page can rank as a video in Google search, including in carousels and other SERP features, video search, and image search. All you have to do is ensure that the Google crawler is able to find and parse your video content — which typically means including structured data — such as with schema.org markup via microdata or JSON-LD. While it’s true that the overwhelming majority of videos appearing in Google search are from YouTube.com, that’s probably primarily because most websites don’t provide the data Google needs to be able to crawl and index their videos for search. Explicit bias from Google toward their own platform no doubt also plays a part, but it’s a chicken and egg situation. In any case, if you’re trying to drive traffic to, and retain traffic on your own website, embedding a YouTube video is definitely not the way to go. The traffic that isn’t immediately sent to YouTube.com from Google search will go there anyway after they’ve watched your video and then clicked to watch another. Are you saying we shouldn’t use YouTube at all? Nope. YouTube can be a great platform for your audience to discover your content, but it’s important to be strategic with your approach. That’s why we wouldn’t recommend using YouTube embeds to serve the videos on your website. Rather than treating YouTube as a repository for all content, instead just put the videos on YouTube that would make sense to new audiences without the wider context of a specific page on your website. Don’t rely on the generosity of the biggest advertising company in the world to send you lots of traffic. What comes at the end of Wistia videos? Whatever you want — a Call-to-Action, an email capture form, some custom HTML or … nothing at all. Wistia vs. YouTube: What’s the Difference? What’s the point of paying for a video hosting service like Wistia when YouTube is free? You’re about to find out.